WELCOME to the LEEDing Tiny Project! Our nonprofit organization's amazing volunteers are super-excited to offer this opportunity to you and those who care about advancing sustainability, green building, tiny houses and meaningful lives. We are joining the tiny house buzz in a BIG WAY -- taking it to the next important level with a focus on healthy, high-performing, resilient and sustainable achievement. Through a tri-partnership with U.S. Green Building Council Florida, Eco Relics, and Norsk Tiny Houses, this project is on track to be the first LEED Certified tiny house in the nation, as well as inspire other tiny houses and communities to build at this level of performance and wellness. Education -- Create an inspiring project that educates thousands about tiny houses, living smaller, easier, more meaningful lives and making a home healthy, high performing, environmentally sustainable and LEED Certified (think 24/7 webcam during build out, open meetings to learn the process, high school and university students helping with ideas and research, road tour ending up at Greenbuild Chicago 2018 ... and more!). Repurposed Material -- Our tiny home will be built from as much reclaimed, recycled and repurposed materials as possible thanks to Eco Relics' remarkable warehouse. 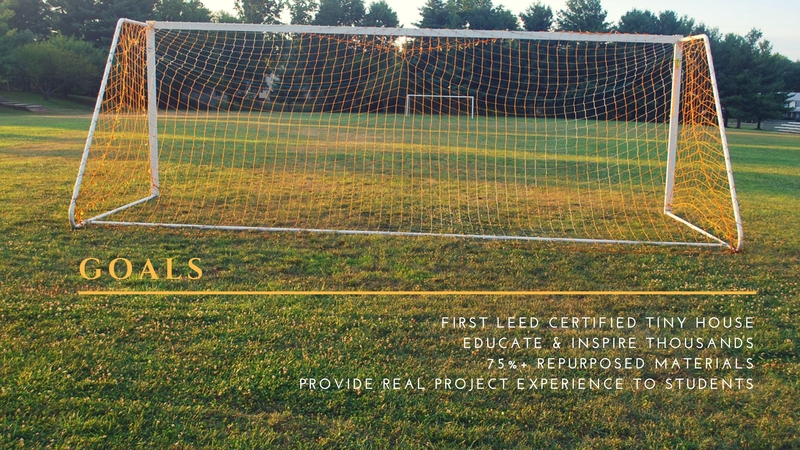 Project Experience -- Provide actual LEED project experience to many including so they can learn on a live venture. 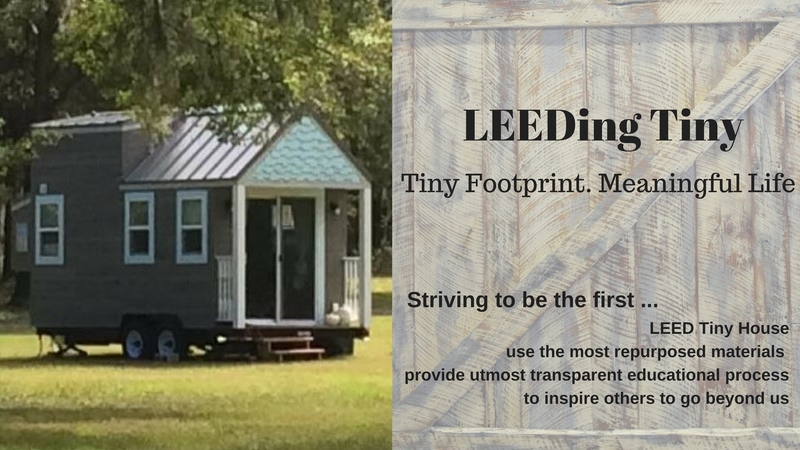 Advocacy Tool – Use LEEDing Tiny to address some of the zoning and building ordinances that obstruct adoption of tiny homes and inspire LEED tiny house communities. Ease the Path for Others – LEEDing Tiny has a large educational component (think blog pieces, infographics, toolkits, etc.) 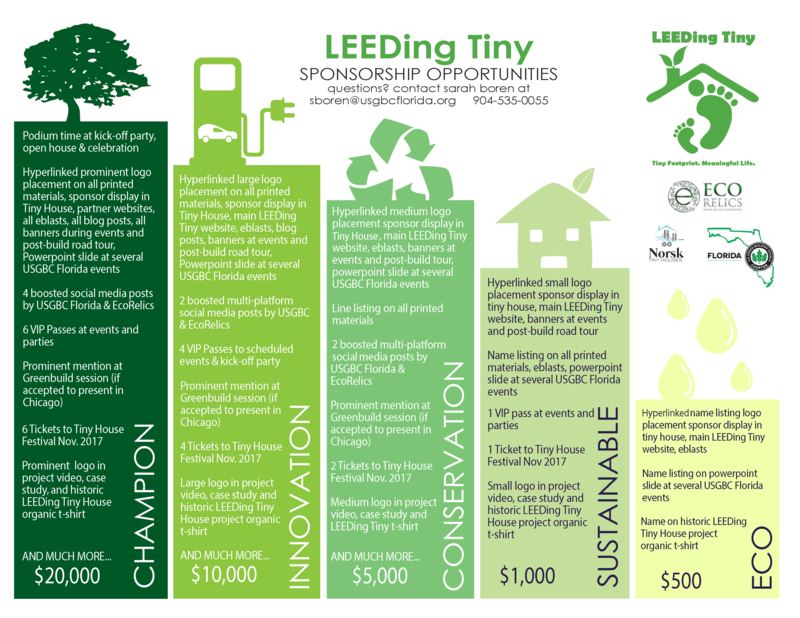 committed to helping those who want to build green and tiny in the future. Give House Away – The final step is to give the house to someone in need, use it to start a tiny house community (our dream would be a tiny house community for Veterans in transition), use as an extended educational tool or some other awesome idea! WE NEED YOUR SUPPORT ASAP! Because this project is on such a fast track to be able to debut at the St. Johns County Tiny House Festival in mid-November, we need to raise money immediately! We have an amazing sponsorship packet and an online crowdfunding campaign for donations with Indiegogo Generosity to make this happen! In-kind support of products, materials and service are also most welcome. If you are ready to support, please click here or on the image below. If you have questions or are interested in a customized package, please contact Sarah Boren at 904-535-0055. Project timeline -- tiny bit Fast! We want this inspirational tiny house built by October 1, so we have time to submit for LEED certification in time to debut at the mid-November Tiny House Festival. So we need to raise all the necessary funds in July and August, build out in August and September, submit LEED documentation in October, debut in November, road trip December 2017 - November 2018 all around Florida, and end at Greenbuild 2018 in Chicago. Final step is to give the house to someone in need, use it to start a tiny house community (our dream would be a tiny house community for Veterans in transition), or some other awesome idea! Watch for upcoming events including a kick-off party, open house, and final celebration, as well as lots of updates via this website, social media and blogs along the way! Wow! 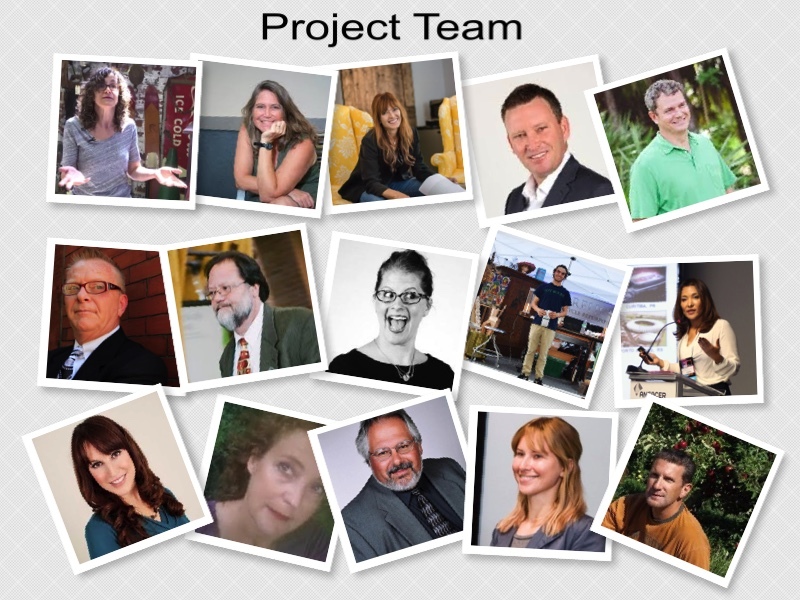 What an amazing group of people we have volunteering their time, talent, treasure and sweat equity! If you see these people around your region, please make sure you give them a big bravo and pat on the back! We are SO grateful to those who are stepping up early to show their support! 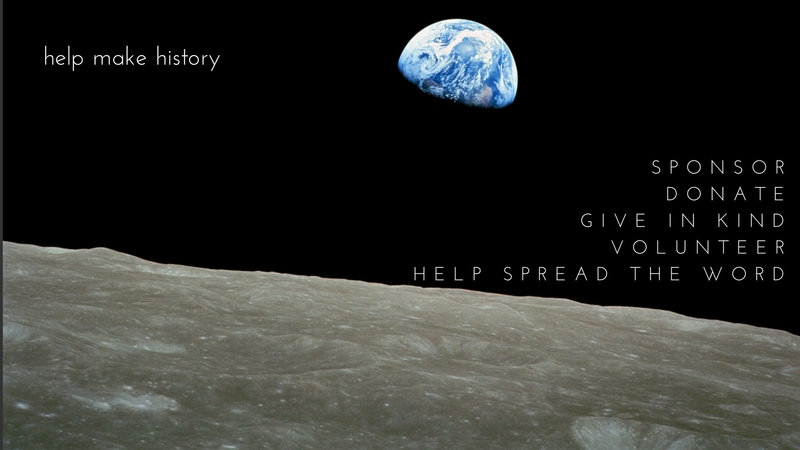 Join them and DONATE NOW!